Produktinformationen "Moon Tides - Jeju Island Grannies of the Sea"
Imagine strolling along the windy shores of Jeju Island, off the southwest coast of Korea. Suddenly, you hear whistling echoing from the sea. Turning to the water, you spot weathered faces bobbing to the surface, and you realize that the sound is the exhaled breath of sea women, known as haenyeo. With a sigh of gratitude, the aging divers have returned to the surface to replenish their aching lungs. Jeju Island's haenyeo are a dying breed, perhaps the last of their generation. As their maternal ancestors did for centuries, they have scoured the island's sea floor, harvesting seaweed, octopuses, sea urchins, turban shells, and abalone. Their numbers have dwindled from 15,000 in the 1970s to approximately 5,600 in recent decades. Driven by economics, these free-divers continue to labor well into their eighties the hardier ones often plunging 65 feet while holding their breath for two minutes or longer. Brenda Paik Sunoo gathered these women's stories while living in their diving villages for a total of seven months between 2007 and 2009. 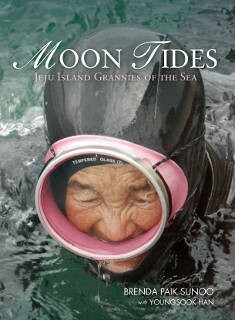 Moon Tides, Jeju Island Grannies of the Sea is the first book by an American journalist to document the lives of these rare divers through intimate interviews and photographs. Their stories will appeal to those of us desiring a life of purpose undulating and infinite as the sea. Weiterführende Links zu "Moon Tides - Jeju Island Grannies of the Sea"
Unser Kommentar zu "Moon Tides - Jeju Island Grannies of the Sea"
Kundenbewertungen für "Moon Tides - Jeju Island Grannies of the Sea"